Over 21,000 members of the Chicago Teachers Union have voted in favor of walking off the job. Teachers have been working without a contract this school year, and last week took a three-day vote to authorize a strike. The results of that vote were announced this morning. List: Cost of CTU Proposals CTU Vice President Jesse Sharkey called it an "overwhelming" number, but it's not much of a surprise: The union held a “test” vote last month to gauge the feelings of its rank-and-file members. In the official vote, 92 percent of members voted last week. 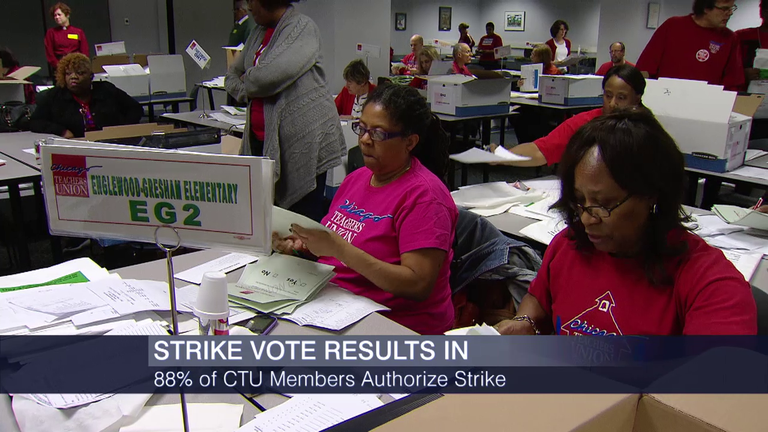 Of those who participated, 96 percent of them voted "yes" to authorize a strike–that amount is equal to 88 percent of the entire membership voting in favor of a strike. The union says it’s still at odds with the district over that 7 percent pension pick-up, also an increase in health care costs and cost-of-living increases. But this morning, Sharkey laid out a number of other concerns the teachers have about the state of the school district. A strike is quite a few more months away. The two sides are still in the mediation phase of negotiations for about three-and-a-half months. If those fail, they enter a fact-finding period, and teachers still couldn't hit the picket lines until 105 days after fact-finding begins. The district says that should happen in February, but the union hopes it would happen sooner because they think mediation has gone on long enough. So, a strike isn't most likely until May, or the beginning of the 2016-2017 school year. Their only chance of it happening sooner is if the state Educational Labor Relations Board orders it, but a hearing isn't even scheduled with the board until late January. The district has said this strike vote is premature. After all that's happened over the summer with replacing the CEO, it believes mediation and negotiations on this multiyear deal have only been going on for a few months. And sources point out that it was the union that rejected the one-year contract over teacher evaluations, even though that contract would've continued the much-disputed pension pickup. "We have the highest respect for our teachers' work and while we understand their frustrations, a strike that threatens to set back our students' progress is simply not the answer to our challenges. Instead, the solution to our $1.1 billion problem must begin with Springfield. What's more, the district says what CTU is proposing–increasing staffing to maintain reasonable class sizes, additional librarians, counselors, restorative justice coordinators and more–would cost the district an additional $1.5 billion a year. We also heard from the Illinois Policy Institute which says the last strike was detrimental to the district's finances, and another one so soon after the last, could be only make matters worse. As to how this vote compares to the strike vote three years ago, it’s pretty close, with a difference of only one or two percentage points. In 2012, just over 89 percent of total membership voted yes, compared to this year's 88 percent. CTU's contract with the Chicago Board of Education expired over the summer and they've been working without one since. The union calls this a labor solidarity rally as members prepare for an upcoming vote to strike. Chicago Public Schools CEO Forrest Claypool is reiterating his call for funding equity from Springfield, saying that if CPS students make up 20 percent of Illinois public school students then the district should receive 20 percent of funding. Chicago teachers begin steps toward another possible teachers strike, as Chicago Public Schools announce big layoffs on the horizon.